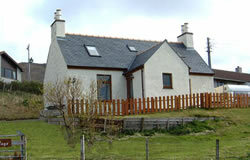 Hillside Cottage is situated in glen in Castlebay and has recently been renovated and refurbished to a very high standard. The cottage has spectacular south facing views overlooking Kisimul Castle and Vatersay and one of the many beautiful beaches to be seen. A welcome tray with home baking on your arrival is supplied. Directions: From Castlebay Ferry terminal turn right, then first left for Glen, the cottage is the third turn on the left. From Airport/Ardmhor Ferry: Turn left onto main road, at Northbay junction turn right, drive for approx 7 miles, turn left for Glen, the cottage is the 3rd turn on the left.